Thanks for stopping by! This is an older product, and I am not presently recommending it. Are you a beginner? Take a look at the best e-cigarette for beginners. Experienced vaper? Look at all of the best e-cigarettes of 2016. The “box mod” was originally a device made by home tinkerers and born out of the desire to create an e-cigarette with longer battery life and a more even power response than what the e-cigarettes commonly available at the time — almost all of them “cig-a-likes” — were capable of producing. What began as simple push-button devices quickly evolved into e-cigarettes with stacked batteries, variable-voltage operation and built-in tanks. With the iTaste MVP, Innokin has made the box mod a mainstream device, infusing an old paradigm with some interesting modern features. In my iTaste MVP review, I’ll walk you through this new device and help you decide whether it’s a worthy upgrade from your current e-cigarette. View the Innokin iTaste MVP at Direct Vapor. It costs $54.95 and is available in several colors. The first thing you need to know about the Innokin iTaste MVP is that it has battery power to spare. With a rated capacity of 2600 mAh, it has a greater capacity than two fully charged ProVari batteries. It’s also available at a fraction of what the ProVari costs. Because a 2600 mAh battery is more than enough to last most e-smokers through a full day of use, the iTaste MVP has a feature that’s quite unique among e-cigarettes: the ability to charge other devices that accept USB power. That’s right — if you’re an e-smoking road warrior, the iTaste MVP can keep your iPhone, iPad, Android device or whatever else running when there isn’t a USB port nearby. Is that enough to encourage a purchase if your current e-cigarette has all the battery life you need? Possibly not, but the fact that the iTaste MVP is also a variable-voltage device might make things a bit more interesting. Through a simple push-button system, you can adjust the output of the iTaste MVP from the standard 3.7 volts all the way up to 5.0 volts for extra vapor when you want it. 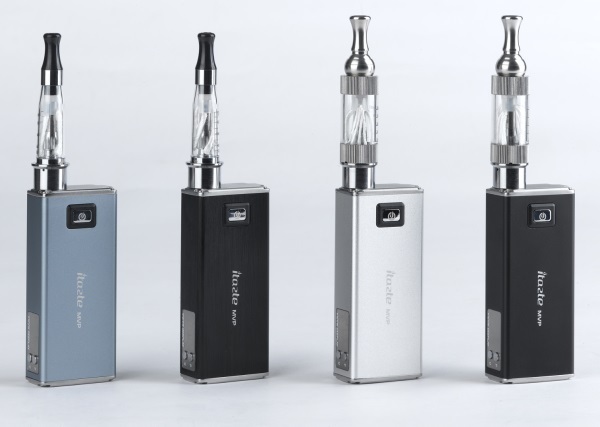 Although the iTaste MVP is an admittedly boxy e-cigarette, Innokin has executed it in a tasteful way. The metal body is smooth and feels nice in the hand, and the power button doubles as the activation button for your cartomizer or tank. As the battery charge depletes, the button’s light changes color from green to orange, and finally to red. Using the buttons and display on the side of the iTaste MVP, you can raise and lower voltage, check the resistance of the attached cartomizer and see what voltage the iTaste MVP recommends for best performance with the connected attachment. I find that the iTaste MVP is at its best when you don’t try to push it too hard. At a power level of around four volts and with a low-resistance or dual-coil cartomizer attached, you can expect all-day battery life and nearly the same vapor production from a full battery charge to near the end of the battery’s life. You can also expect far superior performance from your previous e-cigarette if you’re upgrading from a cig-a-like or eGo. The story is a little different if you operate the iTaste MVP at the full five volts; I find that the iTaste MVP produces a little less vapor than the ProVari at the same power setting, and I also find that the drop in power level is a little more evident as the battery is depleted. Bearing in mind that there is a price difference of more than $100 between the two devices, I think the difference in performance is to be expected. It also has to be said that when the iTaste MVP charges an external device, it can get quite hot. I never experienced a problem due to this, and I haven’t heard of any problems reported by others. All the same, I’d have to recommend against using the iTaste MVP to charge devices in direct sunlight. If nothing else, you might risk overheating the iTaste and shutting it down. I’m also not particularly fond of the included tank clearomizers from Innokin. The taste they produce isn’t the best, and they are subject to leaking when placed upright for extended periods. Needless to say, this can lead to some nasty accidents. If you’re thinking about upgrading to the iTaste MVP, though, you’re likely to try the Innokin clearomizers for about five minutes before switching right back to your preferred cartomizer or tank. The iTaste MVP will work with any attachment that has 510 threading, and most eGo-threaded attachments will work as well. According to Engadget, the first e-cigarette mod was developed in the United Kingdom by father and son Ted and Matt Rogers. Although the team modified the body of a flashlight to create the mod, it earned the nickname “Screwdriver” due to its resemblance to the tool. The iTaste MVP doesn’t officially have a replaceable battery. Although it might be possible to replace the battery, the cost of doing so might be nearly as high as that of buying a new iTaste.